Browse content similar to Christopher Timothy and Patrick Robinson. Check below for episodes and series from the same categories and more! ..paired up with an expert. We're on a celebrity road trip with two of Britain's favourite actors. and All Creatures Great and Small's Christopher Timothy. I'm seriously excited about this. I know it's pathetic, but I really am. when he played James Herriot in All Creatures Great and Small. regularly watched by 20 million people. And Christopher's been a familiar face on stage and screen ever since. is one of Casualty's longest-serving cast members. And he's even found himself taking Christopher's pulse! which is a benign, non-cancerous tumour. -You had all the dodgy dialogue. -And it was when you'd just started doing Strictly. and danced his way to the Strictly Come Dancing semifinals. -Walking seemed to be a problem! Here's hoping dealers won't be as tough on his haggling technique. Patrick and Christopher are driving a 1974 British Jensen Interceptor. in the battle to make a profit from antiques. and auctioneer James Braxton, are on hand. Is there a theory, Margie, can you smell silver? But I don't go around smelling silver, James! in this left-hand drive 1969 Porsche 911T. So, we're going to meet our celebrities. -He's a man of two Christian names, isn't he? -Christopher Timothy, which is very confusing. for an auction in Cardiff. As the actors make their entrance, it's time to decide the teams. -You're James, I know you are. -Hello, Christopher, how are you? -Hi, Margie, how are you? -Hello, Margie, nice to meet you. Hello, James. Good to meet you. -I might be very hurt! Only on the grounds of I want to learn to dance! -I'm very pleased. So am I, sir. -I've never driven one of these, it's rather fun. -You're going to take the Porsche. -All the very best, my friend. while Patrick and Margie enjoy the Interceptor. is in the historic Hereford market town of Ross-on-Wye. the industry of the cities to enjoy the scenic beauty of the Wye Valley. In fact, it is said to be the birthplace of British tourism. But these two are not here to take in the views. Oh, no. They need to look for antiques to take to auction. home to Elizabethan House Antiques. Come on, Christopher. Yes, our first big test. -How are you? You must be Fred. -The cheese goes underneath here. You can see there's still a ring down there. You'd press it down. which then unify into a single body, a block of cheese. where their weight helps to press the next batch. Both blessed and resourceful is the cheesemaker! -How much is on the cheese press? Now, that would be some discount. But the press has given James a cheesy angle to work with. -Have you got anything else associated with dairies? -I'll have to think. Not furniture. allowing James to begin Christopher's education in antiques. -How much has he got on that one? James Braxton's number one rule. -At the moment, so I understand. See, I've done my homework. Full marks for effort, that man. -Dismissed in a phrase, really! I've got so much to learn, and so little time. He's a keen student, too. You've got a nasty crack there, haven't you? -when a crack was considered to be of no consequence. Ah, well, it's not an exact science, Christopher! You asked me about dairy equipment. I've got a milk bowl here. "flies walking around the rim." -So a fly can't walk on the edge? I think that is advertiser's puff, that. -How do they do that? -Because the rim is like that. They are slightly committed, aren't they? Also, one of the great things is you can hang it up. -It hangs up when not in use. But remember James's number one rule, everything is negotiable. What's the best you can do on that? Got to be 20. 20, I'll do. -I think we should just go for that. £20 is a great deal from Fred. -Right, well, blessed is the cheese maker. Off the boys go with the first purchase of the road trip. These two are off to a flying start. Did you suddenly, as a little boy, think, "I want to be an actor?" I suppose it did... It kind of did happen like that. Was it a shock for your mum and dad? -is that my mum passed away when I was 15. -My dad brought me up. when I was about 20, till about 23. I was homeless for, like, a year when I was in drama school. -There wasn't the encouragement from family. -A great credit to you. So I kind of kept going with me. you have to believe that there is always a job for you. The town's name derives from the Saxon for "valley with a band". -Here we go, Margie. I'm excited, you know. in this delightful grade II listed building. Ever-helpful Richard is the owner. Nice to meet you, Patrick. Have a good rummage around and see what you can find. -We'll kick off. Thank you. -What are you looking at, Patrick? -I'm looking at the silver. Ah, Patrick's already found the way to Margie's heart. -That's for measuring out your spirits. which is always highly rated. Hallmarked with a ticket of £95. -So what's the absolute very best? -Right, it's a thought. Is it a thought? these two are shaping up to be a right double act. Stan Laurel, baby. Stan Laurel, baby. -What are they up to now? It's time Patrick got down to business. -They are copper, aren't they? -It's popped off a couple of times, maybe. It shows what a hard life they've had. Somebody's been carrying these back and forth. The tap's been off on that. -Pfft! Do you like them? For some unknown reason, Patrick likes those. -They've got to be cheap. Go on, £20. £10 each. That's the deal of the day. It's worth more than that in scrap, I would have thought. Two tea urns that could be used for putting plants in and things. Two urns for £20? He's good once he gets going. I think we might be developing a theme here. I kind of like this and I thought, I wonder if it's pewter. And it is. You see, I hate pewter but I like the design of that. But I was going to say, I like the design. I was going to put a ticket on that of £70. You are throwing me out of the place. I mean, I'm looking at 35 quid. -That's exactly what I was going to say. £35. That is close to being thrown out, isn't it? Patrick's just done his first deal of the road trip, two lots for £55. -Oh, gosh. I'm worried about that, Richard. Margie, too late for second thoughts. Why not cheer yourself up with some silver? -What about that little single and double measure? Richard has already knocked £20 off the ticket price of £95. Margie will be very lucky if she can get a further discount. -What is the... What's your best on that? 40 is the absolute death, I think. At £40, that's better than half price! -There's a bit of weight to that as well, isn't there? OK.
-Are we all agreed at 40? -We've bought those cheap copper things and we've bought that. All right, 40. No problem at all. 40 pence! That's brilliant, look at that! and his expert, James, are back on the road. that I was a bit non-contributory in that last section. To be frank, we both passed the lot we actually bought. Well, let's hope nothing's missed at your next shop. Located on the outskirts of Ross-on-Wye is Blank Canvas Antiques. Dealer Andy normally sells to the trade. some market fresh stock with their remaining £380. How much for your butcher's block, Andy? -We can't afford that, can we? -How about Mr Tiger, erm, lion here? -And what about your lantern here? Mm. They might struggle in here. they're not an option for our treasure hunters. -I've got great taste, haven't I? -I reckon you've got the pocket for it. -This is going to be a tricky one. That is a beauty, isn't it? but Christopher has been drawn to a bedside cabinet. But this is not... Andy! -This isn't one of a pair, is it? I do get pairs in occasionally but they are quite hard to find. They are so well made. Ah, Braxton's found the biscuit jar. Do me a favour, would you pass me that bedside lamp? Stick it on top, see if it works. Just a bit. And some felt on the bottom. You realise now, you are breathing sweets all over your glasses. Ginger nuts, the king of biscuits, as far as I'm concerned. Christopher's doing all the work here. and the bronze candlestick converted to an electric lamp stand at £75. Could we do a deal here, Andy, for the two? 210, to have a deal with you. I don't want you to go away empty-handed, really. -100 for that and 60 quid for that. -No. I can do 200. What are the chances of a profit on this, on these? They're both items are of lovely quality. That's indisputable. of all this stuff? Oh, I don't know. Andy, if we bought the bronze on its tod, what would that be? That's kind. I think we'll do that. Yeah, thanks a lot, mate. God. Talk about the tortures of purchasing. Should be a delight. We should be breezing in here. I've put on ten years. Ten years! and leaves with the 19th century bronze figure lamp base for £60. to visit a family home with a remarkable history. -Hey, Coughton Court, here we come. We thought the whole door was going to open. -Hello. Welcome to Coughton Court. Coughton Court is the ancestral home of the Throckmorton family. 20 generations have lived here since 1409. And guide Vic knows all about the building and the family. What's significant about the Throckmorton family? and have been all the way through the ages. Queen Victoria, Catholics were persecuted in one way or the other. remained Roman Catholic right through that period. Yes. And there's a history to the place. -There's a lot of history to the place. loyalty to their church or Protestant monarch. had to do so in secret. This is what we call the Tower Room. because they've got a spiral staircase all the way up here. looking for priests or evidence of practising Catholics. And the 600 year old house continues to reveal many secrets. Tell us about this incredible thing? It's dated 1596. At the top there you can just see it. Catholic families who were imprisoned during Elizabethan times. It is a kind of Catholic propaganda document, if you like. This would have been a secret document in its day. You would be in trouble if it was discovered in your possession. And is it the only one in existence? It is unique. There's nothing else like it. to remain alive throughout the Reformation. in a treacherous plot by Catholic militants to kill the king. and Guy Fawkes, the conspirators had some kind of link here. which most people seem to think, but a man called Robert Catesby. -And it wasn't just Catesby. four of the conspirators were related to the Throckmortons. weren't staying here, they were at another of their properties. And they actually let his house to one of the plotters. Guy Fawkes being caught red-handed with 36 barrels of gunpowder. that their friends and loved ones were on the run. Eventually all the plotters were caught and executed. that was meant to follow the annihilation of Parliament. Didn't that drop them in it, though? Well, the Throckmorton family managed to get away with it. If they were involved they said they knew nothing about it. They were interrogated and they got away with it. to remember the failed coup. and talking to us about this incredible place. Fantastic. Thank you very much. I've enjoyed showing you. and James are scouring the high street for more bargains. -It's still lovely weather, isn't it? and Sally have only been in their new shop for a few weeks. There's plenty of new stock for the chaps' remaining £320. and collectibles at one end of the shop and under the counter. What is that interesting thing at the end there? I think the cards were brought up that way, sliding the cards out. What a clever system. I like mechanical things. So that would just irritate them up. You could put a stack of your visiting cards. which dates from the early 20th century. It's silver and sports the London hallmark. There's something early '50s about it, I can't put my finger on it. There's plenty of other goodies under Ian's counter. -Isn't that the Welsh thing? -It is the national thing, isn't it? I'm no gardener, but that looks more like a narcissus. he thinks is a daffodil. This compact is engraved "love to Peggy"
and comes with the original outer cover at a ticket price of £85. -We've got to buy that, haven't we? -I think we do, yeah. But you must buy your thing as well. -Are we as one on this? Thank you very much. Very kind. Thank you very much. Ian's agreed to knock £10 off each item. That's the calling card case at £35 and the enamel compact for £75. so for now, teams, nighty-night. and our actors are back in the Interceptor comparing notes. Are you pleased with what you've got so far? with the things we've got. Yeah, I'm really looking forward to today. when an expert agrees with something you say. Christopher is a real enthusiast. I think he's a fan of the show. -Don't you like enthusiastic people? all bargains great and small. a bronze lamp base, card case, an enamel compact. Leaving them with £210 to spend today. I've got great taste, haven't I? And Patrick modestly liked everything Margie loathed. I kind of liked this and I wondered if it's pewter. a solid silver spirit measure and a pewter tea set. Leaving them with £305 still to spend. -I've had enough of it this morning. Well, Margie, would you like to step this way, darling? -See you later, my love. Both teams are making their way to Gloucester. have been an important thoroughfare for trade for nearly 2,000 years. home to over 20 dealers packed in over three floors. but Patrick and Margie have arrived first. -so we need to whizz round before they get here. -Cos they're going to be hovering. Meanwhile, Chris and James are taking in the sights. -It is clever, isn't it? I would have loved to have seen the Pool of London working here. Instead bits and pieces become coffee houses and restaurants. the other team have first dibs. brooches and things. That's quite reasonable. If we got two or three of those. That one with the bird on it there. What's that little brooch thing? Best get in, chaps, you've got £210 left to spend. That's not Welsh, is it? Could be over Wales. who's minding another dealer's cabinet. She's got 14 on that. cos under my eyeglass I've seen something. Yeah. It is, but we've got a slight problem. This is why you need one of these. -Damn, I can't see anything. You don't notice it until you have one of these eyeglass things. Even so, £14 is still a great price a late 19th century silver brooch. Look up occasionally, look at the plane. Isn't that fun? James has spotted a model second world war biplane. -Do you think it will be expensive? The chaps need to snag a dealer of their own. Can we also have a look at this one here. That's quite pretty, this locket. -A little bit of history in it. With regard on the top, which is lovely. and have a photo in the centre of each. Meanwhile, their rivals have roped in Vic to help them out upstairs. We looked at this fellow. The biplane is a Gloster Gladiator. and was one of Britain's most successful pre-war exports. It was manufactured with pride just six miles from where we are now. This scale model is rather spiffing, don't you think? I think was probably made by an enthusiast. -Probably made in the '50s, '60s. so I think it's wood and bound in some type of canvas. -And then treated with whatever. -And treated exactly the same way. All the rudders and everything else work. -you can take it home. I've just noticed a very rare item in that cabinet. -Go on, dig it out. -It's not made of silver or gold. That's actually a last rites cross, that is. If you notice on the bottom it's got a skull and crossbones on it. they'd put that into this hand. Basically just read him the last rites just before he went. -Well, I didn't know that. the crucifixion, a place known to some as The Place of the Skull. Rob's convinced this crucifix was used in the First World War. Gosh, you wouldn't want to part with that, would you? How many hands have held that? Yeah, but the history of it. Great object, but Margie only has eyes for the silver. and the dealer is asking for £14 for the brooch. I'd like the very best on those two. She wouldn't take 45 for those two, would she? I'll give her a try. and a bamboo table that's just come in. I just think it's just so resourceful. you can steam it, you can joint it. Has it got a nice tile top or is it lacquered? It's got a lacquered top. That's what it is, so we have to put that piece back in. But as it is, 25 quid. The table dates from around 1900. It's damaged and has a rather tired appearance. It will be a gamble purchase even at £25. It's quite a pretty top. It's been bashed and everything. And we've got little birds here, rather exotic. Oriental, lacquer... I quite like that. I'm trying to think in terms of our aim. Would you do anything to it between now and the sale? I wouldn't. I would sell it like that. -Somebody buying it could retrieve it. Knowing as little as I do, I agree with you. -I think we should buy it. -Lovely. Shake the man's hand. Deal done. A broken bamboo table for £25. On the other side of the shop, Robert has news. The very best she can do is 51. I've never bought at 51 before. -So 45 is a complete no? -Well, it's what you think. But I think it's worth it. Two pieces of jewellery - £22 off the ticket price. Right, we've got four items. One more shop. -But what about that cross? I think it's a really interesting story behind it. -Shall we go back in? Be quick. There's competition behind every cabinet. These are very nice, aren't they? Very nice indeed. And those are very good, yeah. Wait a minute. I've seen you on the telly, haven't I? -Going good, how are you? You're looking a bit pleased with yourself. -It's best not to fraternise with them. Come with me. They look confident. But they're still buying. -But we have every right to be confident. We're done, so let's leave. while Patrick still has unfinished business. Where's that cross, beautiful cross? we might quite like that, particularly Patrick. Can we broker a deal? We can do it for 25. Those are quite rare. -Oh, lovely. Thank you very much. Patrick now has jewellery, tea urns, some pewter ware and a crucifix. A good selection for auction. to give him the role of James Herriot. "The hierarchy are nagging me to cast an established name. "So would you like to play Tristan?" "No, it's James Herriot or nothing." and through all sorts of machinations I finally got the part. It was the most joyous time and the most joyous job to do. and played significant parts in English history. intriguing story with a transatlantic twist. Jonathan MacKechnie-Jarvis knows all about it. If you've got time, would you like to come up to the tower? I'd be very happy to take you. Mind the step as you come in. which has got its own story to tell. What you're looking at here is a chime machine, 1762.
at intervals throughout the day and night. and there would have been a tensioned wire running to the bell. choir boy named John Stafford Smith would have sung in these stalls. and gained the reputation of being a gifted organist and composer. become one of the most recognisable pieces of music in the world today. was adopted as an anthem by his social club. and became popular on both sides of the Atlantic. how did that, and why did it become the American national anthem? America found itself in a bloody battle with the British. the Americans held their ground. Suffering heavy losses, the British withdrew. Francis Scott Key to write a song to celebrate the victory. He put his lyrics to Stafford Smith's tune. So actually a popular song became the national anthem. God Save The Queen being a popular song, can you? -..the same snap to it. anthem of the United States of America. that link back to our chime machine and the tunes that it plays. -Yeah, thank you so much. Thank you for coming. Good to see you, James. for treasure to take to auction. -Thank you very kindly, ma'am. -Cos I'm about 5' 9". -I know. You're a tall lass. and a shop with 40 dealers - Fab And Faded. That's not the dealers, it's the name of the shop. -Well, this looks all right. -It looks very, very nice. And Dudley's the man in charge. Hello, Dud. -All right, Patrick. Nice to see you. -Very nice. Can we have a look round? -If you need any help just give me a shout. and there are two floors of cabinets to rummage through. Wow. You're loving this, aren't you? ..produce quite a decent amount of cash...is quite interesting. -Model cars in the boxes. not the big ones but the little, old ones. -They're not old. £2.50 each. No, they're not £2.50 each. Cos they're not very old. But ever-observant Margie has an item in her sights. there's a whacking pair of old Victorian industrial bellows. What do you mean a whacking pair? How big? -Big, like nearly as big as you. At 5' 11", that's big. -Yes, let's see this big bellows. -Are they as big as you? -You're right. It's as big as me. -What would one do with them? -I wonder what they were used for. I wonder if it's something to do with the pottery business. some £20 more than what these two have left in the kitty. -It's a funny old thing, isn't it? But I think the stencilling is probably later. I like it cos it is a funny old thing. Just thinking about it actually working. -Even though it may be very crispy leather. God forbid it didn't sell. Can you get it in your car? -OK, well, I will be advised by you. -Be a man and make the decision. It will be up to you. It depends what we can get it for. And that depends on Dudley. Right, are we having it or are we not having it? -I was thinking of 100 quid. I mean, that is so un-me I can't tell you. He's very excitable. These actors, you know. Bagging those bellows certainly has Patrick all fired up. -You can pay for it and carry it out now. -Cos you look a big lad. Margie seems to rather enjoy having a man of muscle in tow. Thank you, sir. Thank you for my bellows. My giant bellows. reduced from 250 to £100. Shopping complete, it's time for the teams to compare treasures. -Does this make you feel uneasy? -Oh, I'd like that. That's really nice. Bronze? Feel the weight, if you wish. -Never mind the quality, feel the weight. -Any chipping on your enamel, sir? Very pleased to say none. Any chipping! How rude. -It sounds like a village in Cornwall. Oh! Look at this! Blimey. Job lots as well. -Yeah, it is. I think pewter might be making its way back. -Were going to ratchet that business now. It's big in Cardiff, I hear. Pewter, big in Cardiff. I like your urns. -I love those. I couldn't resist. -They've had a hard life. -That's a very good buy. The biggie's still to come, though. -I think here should be all right. -Can we open our eyes? -That is... That is a pair of bellows. in a large room over an inglenook fireplace. - Someone's going to want it. - Yes, they are. -That's good. It's lovely. Blimey. -Let's wait and see what happens. Good haul, people. Good haul. All very polite but what do they really think? -Ours stuff's pretty good, don't you think? -Oh, come on, man, that's a great laugh. -I think the bellows are brilliant. -They are good, aren't they? -Well, I didn't think it was what it was. -I thought it was a potty. -No, it's a milk pan. -The fight is on, isn't it? -It is going to be a fight, don't you think? -Yeah, and it's coming to us very soon. As soon as you get to the auction. It was crowned the capital in 1955. I've been lucky because Christopher is a real enthusiast. but I'm doubly excited about this. Really, really excited. I think Patrick, the same. Yeah, he's enjoying it and we've had a lot of fun. PATRICK: I quite liked... The buying was fab. But how auction-experienced are you in relation to Cardiff? At all? I have never been to an auction. Well, you're in for a treat today. and the man with the gavel is Ben Rogers Jones. So, what does he think of our celebrities' haul? Well, the bellows, we call items like that antique slugs. they leave a trail of mess on the floor. it's got a severe leaning towards shabby, I'm afraid. We might struggle with that one as well. The measure's quite nice. Quite a nice novelty piece of silver. Quite a reliable market. The mechanical silver card case, that's quite nice. and I would expect that to make between £40 and £60. Christopher and James set off with £400 and spent £215 on five lots. I've put on ten years. Ten years. Patrick and Margie spent £271 but have a total of six lots. Well, it's time for our teams to take their seats. There's plenty of interest in the sale room and online, too. You may turn over your exam sheet now. Patrick and Margie's solid silver spirit measure is up first. So, I'm straight in at £60. At 75, 80. £80. Is there 5? 80 is on the book. Any advance? Last call, then, at £80. That's Patrick and Margie off to a great start. the first lot from Chris and James. I'm straight in at £32. Is there 5? -Dignity. Dignity at all times. 50, even better. At £50. 55. 55. New bidder now. 60. 60. £60. Is there 5? Going to wrap it up, then. Now, now, dignity at all times. Patrick and Margie's locket and brooch are up next. Some haggling lowered the purchase price to £51. Is there 40? 40, sir. 40. Put it down. Put it down. 40... 5, just in time. They almost broke even. Just £1 shy of the purchase price. At least the first loss of the day is a small one. -That went too high, anyway. Next, Chris and James's milk bowl. I'm straight in above estimate. At 12. 15. 18 with me. £18. At £18 on the book. At £18 and the hammer's up. £18. A loss of two pounds. Both teams have had profitable and losing lots. But Margie and Patrick are in the lead. Say nothing. Say nothing. Just let them comment. The pewter tea set is up next. Margie needed some convincing, even at £35. 20 if you like. £20. Is there 5? At 20. £20. Is there 5? -At 20. All done now at £20. £20. Oh, sold for £20. That's a loss of £15. Perhaps Patrick should have listened to Margie after all. Next up is the silver compact. James loved the daffodil design. Welsh-born Christopher thought it would do well in Wales. I'm still uncertain about those daffs. It's a gamble at £75. 50. Thank you. Is there 5? At £120, is everybody done? The gavel's down at £120. That's a super £45 profit. Smug One and Smug Two. Patrick and Margie on catch-up now. I've got 20 to start. Is there 5? Is there 5? 5. 40. Hey, that's a bit of OK.
A healthy profit of £50. -You're back in the game. -Are we back in the room? despite the damage - bought for £25. Well, there's not an awful lot I can say about this. -5. I've got a 5 online. £5. -Don't book a cruise, as my dad would say. Chris and James's table was more boo than bam. Sold for a £20 loss. -No, you're not. No, you're not. to claw back some cash. Patrick's pair of Victorian copper and brass tea urns are up next. At 30 in the room. At £30. Is there 5? At 30. At £30. Is there 5? 35. Is there 40, sir? £35. At 35, is everybody done? have URN-ed Patrick a pretty profit of £15. Well, it was better than nothing. And it keeps them in front. the Victorian elm and leather bellows. We've got some muscle here. Don't worry, we'll get it in your car. That's the last call, then. I hope they don't want it posting. Patrick may have loved them but it's an £80 loss. of Chris and James's 19th-century bronze lamp base. 50. Thank you, sir. £50. Is there 5? Nice piece at £50. 5 anywhere? Where's 5 now? At 50. Is there 5? £50. Is there 5? £50. All done at £50. The hammer's up now. A loss of £10, but it sounds like James has done the maths. James, did you lose money on that? -It's doesn't matter because we had the bellows. until the bellows blew them off course. leaving them with a total of £358.60. Christopher and James fared only slightly better but came out on top. After costs, they were out of pocket, too. But only £7.54, giving them a final total of £392.46. - Congratulations, Christopher, sir. - I don't care about winning. -So, Patrick, how's it been for you? -I've had a really nice time. Sorry. 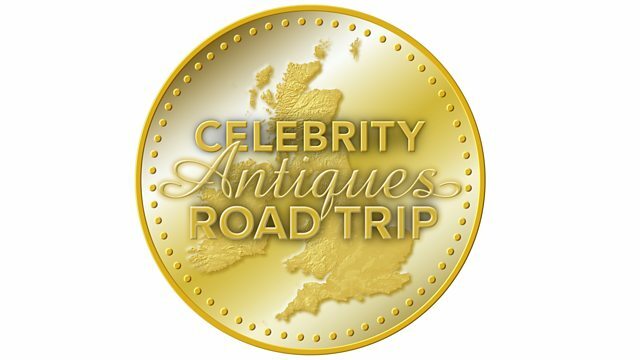 All Creatures Great and Small and Doctors star Christopher Timothy and Casualty's Patrick Robinson are the next celebrity road trippers. They make their way around Gloucestershire and Herefordshire with the help of experts Margie Cooper and James Braxton. Christopher proves to be a worthy student and Patrick shows who is boss by picking up an eclectic mix of goodies for the auction.